Pull plenty of on-card autographed memorabilia cards featuring veterans and rookies alike! Look for one Rookie Jersey Autograph per box, on average! Find on-card signatures in Main Exhibit Autographs featuring rookies, veterans and legends of the game! Chase autographed memorabilia cards highlighting the aerial accomplishments of some of the NBA’s best dunkers! Relive some of the NBA’s top championship teams in this rare multi-signed autograph insert! 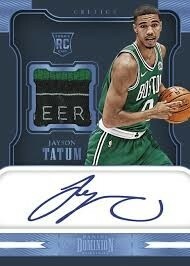 Look for stunning rookie cards printed on metal and falling one per box, on average! Find oversized swatches from the NBA’s top stars in Mammoth Materials! 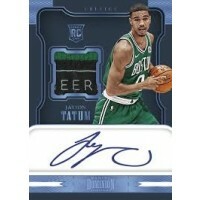 Pull autographed material cards from the top front court stars in the NBA - both past and present!